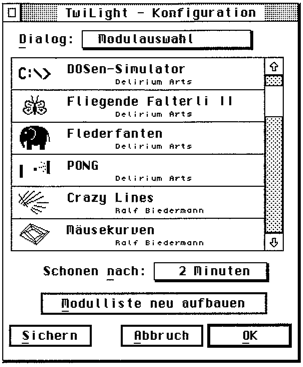 TwiLight was developed from 1991 to 1997 by Alvar Freude, Peter Scheerer (design and code) and Dragan Espenschied (GUI-design, graphics and sound). The software works on any ATARI TOS compatible system: TOS itself, MagiC, MagiC Mac, MagiC PC, MultiTOS, Geneva, MultiGEM and whatever else there is around. Up till 1997 TwiLight was sold by Application Systems Heidelberg to our full satisfaction. The main dialog where screensaver modules could be selected. Notice the dialog switiching popup menu, today such a function is usually executed with tabs. A dialog for setting up properties of a module. Please notice the progressive use of a slider that displays the set up value inside the sliding element. TWILIGHT.ZIP Version 2.08 complete, 939 kb. Compatible with WinZip, good for emulators. Get additional modules from Björn Spruck. Simple but feature packed interface to C and assembler to write own modules. For example TwiLight gives you a color depth transparent sprite engine and the ability to play sampled sounds on any system. 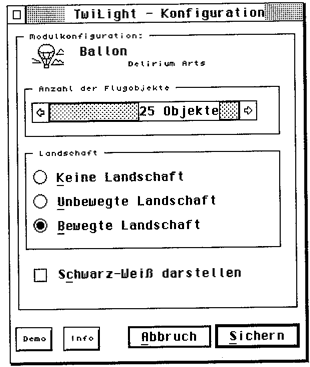 Descriptions of Features of Version 2.0 not covered in the printed handbook are available as a HTML file, German language. All graphics ans animations have been made between 1991 and 1993 with Degas Elite and Cyberpaint II on an ATARI ST. No object has more than 16 colors, objects belonging together have the same 16 colors. Except for the explosion at the Five Mutants. This is the classic pink Bat-O-Phant, in TwiLight you could select from some colors. The Bat-O-Phants were flying from the right to the left. The year 2000 seemed like the distant future back then … Obviously, this was a parody of the famous After Dark® Aquarium. After Dark used to be the ruling screen saver application for Macintosh and Windows 3.11 at the time, but it was technically a joke. TwiLight was much better! The herd size of the partying penguins is adjustable, and also what they drink (from water to ethanol), how much alcohol they can take and their thirst is a matter of configuration. Depending on these settings they start dropping, burping and vomitting sooner or later. Sometimes a really bad thing happens. — Penguin Party was the main sales argument for TwiLight on fairs. The tune “Ballonx” on Maxi German Rave Blast Hits 3 by Bodenständig 2000 was originally meant to play along to this module. But music while screensaving turned out to be too disturbing. Again, this is a rough approximaton of how this used to look, using <marquee>. HTML5 rulez! These graphics are based on monochrome handy scanner data, kindly supplied by MB. I cleaned (pictures from handy scanners looked quite ridiculous these days) and colored them in Degas Elite. The cook got mad because his pans start to fly around and he has to catch them. You see this one unused color in the palette? The user could change the pancake sauce by changing this color. However, the original graphics of pancakes with sauce have been lost. This module was switchable between two modes: In the first, the mutants are just goofing around on the screen, in the second you can blast them with a crosshair. The explosion was made 1995 or 1996 with Apex Media on an ATARI Falcon 030. I had put some work into the original worm animation so the worm does not appear like sliding on an icy surface, but moves forward in the right rhythm. This is not reproducable with the <marquee> tag. This web page can not really show how the modules behave because the presented objects are freely programmable and moveable sprites. TwiLight’s sprite handling also allowed for sprite graphics to be flipped so the objects could move into the opposite direction for example. There were great sound effects in some modules. The behaviours were coded by Alvar Freude and Peter Scheerer. There are also many modules with generated rathen than drawn graphics. Download all of this at the top of the page.